The first race card of the Obama era is now in play. In an apparent bid to save his political life -- or perhaps just irritate and confound his enemies -- Illinois Gov. Rod Blagojevich is trying to wedge a black man into the all-white Senate. 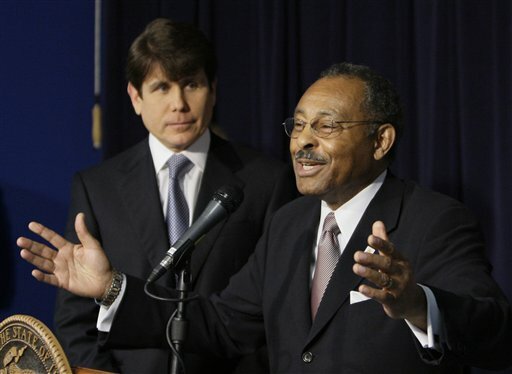 On Tuesday, Blagojevich's choice, Roland Burris, was turned away on Capitol Hill when he tried to take his seat. So far, the episode has not produced a full-throated cry of racism, and many black political leaders are lying low instead of lining up behind Burris. The fact that America's first black president has come out against seating Burris may be preventing the dispute from turning into a major racial flare-up. Still, the drama has forced racial politics, once again, to center stage. And how it ultimately plays out could affect hopes for the "post-racial" society supposedly heralded by Barack Obama's election. "The symbolism is very powerful," said Laura S. Washington, a politics professor at DePaul University and columnist for the Chicago Sun-Times. "The fact that this is an overwhelmingly white Senate that's stopping Roland Burris, a qualified, distinguished, by all appearances senatorial appointment, and white men are standing in the door, I think that's very powerful, and it sends a very powerful message to African-Americans who have always distrusted the system." Blagojevich clearly understands those sentiments, as does Rep. Bobby Rush, the former Black Panther who represents a congressional district on the South Side of Chicago. Less than a month after calling the corruption charges against Blagojevich "so heinous that he has forfeited his right to appoint someone" to Obama's Senate seat, Rush stood next to Blagojevich and Burris last week and pleaded: "I will ask you to not hang and lynch the appointee as you try to castigate the appointer." Later, Rush called the Senate the "last bastion of plantation politics." "If there ever was a playing of the race card, this was it," said Chris Rabb, an activist with afronetizen.com and former legislative assistant for Carol Moseley Braun, a black woman who preceded Obama in the Senate seat. "Blagojevich may be crazy, but he's not stupid." But Rush's accusations have not caught fire among large numbers of blacks. Warren Ballentine, a syndicated black talk radio host, said that in the view of many of his listeners, "This is Blagojevich sticking it to people. It's not a black or white issue." It's certainly a complicated one. Obama himself has said Burris should not be seated because of the taint of corruption surrounding Blagojevich, who is charged with trying to sell the Senate seat. And Obama's opposition to seating Burris could sorely undermine any attempt to make a racial issue out of the matter. Moreover, Burris was officially denied entry to the Senate because his credentials were not signed by Illinois Secretary of State Jesse White -- who is black. Some political observers have speculated that Blagojevich appointed Burris, the 71-year-old former Illinois attorney general, to win over black support in his bid to stave off impeachment, or to influence the jury pool if he stands trial on the corruption charges. Groups like the NAACP and Congressional Black Caucus have not publicly supported Burris, though they may be working behind the scenes to get him seated. The Rev. Al Sharpton, whom some might have expected to be leading a march or three, has been muted in his support. Sharpton acknowledged that the Senate would have objected to anyone Blagojevich appointed. But "Blagojevich has really checkmated everyone and used race as a cover. I think it's interesting that Roland was never on his list before," Sharpton said. "So when did he get this conversion to Roland and why, no one knows. But at the end of the day it doesn't matter to many in the African-American community ... he's put us in the position to get an African-American senator." Although many blacks expressed disgust with Rush's naked racial rhetoric, others were moved by Burris' quest to gain entry to the Senate. "It's a travesty," said Rod White, the owner of Bertha's Soul Food in Los Angeles, where he said his customers had been talking about it all day. "The man walked over there this morning and he was rejected. It reminded me of my father. He's 72. An old black man walking in the rain and they closed the door in his face." In Chicago's black neighborhoods, there is talk of a conspiracy to keep blacks out of the Senate. The government arrested Blagojevich to keep Illinois Rep. Jesse Jackson Jr. out, the theory goes, and now it is trying to stop Burris. Bryce Colquitt of Orland Park, Ill., a 20-year-old college student, formed a "Roland Burris for Senate" group on Facebook. "As far as Mr. Burris being black and he'd be the only black (in the Senate), I think it's a factor. I don't think it's the most important and defining factor," he said. "I'm black, as much as I'd like to see black people in the Senate, I'd also like to know Illinois is being duly represented as every state is." That will take some time, as the legal and political fight plays out in Washington. "Blagojevich made what the hip-hoppers call a gangster move," Sharpton said. "You got to give it to him. Whatever his motive, he put on a move that put everybody in this situation." Associated Press Writers Mike Blood in Los Angeles and Sophia Tareen in Chicago contributed to this report.